Oman is not a soccer powerhouse. But the Muslim-majority country on the Arabian Peninsula is trying to get there. Oman’s senior men’s national squad is currently tied for 93rd in FIFA’s world top-100 ranking, and going into this month’s AFC Asian Cup in Australia, had an opportunity to climb a few rungs on the ladder. For any advancement to take place, however, Oman needs consistent superstar performances from the best soccer player among the country’s approximately four million citizens — goalkeeper and national team captain Ali Al-Habsi. Aged 16, Al-Habsi was drafted into the Oman U-17 national side despite just a handful of games played in Oman’s third division. Not even first choice in the squad, it was a flash of brilliance — a superb penalty save during training one night — that captured the imagination of the goalkeeping coach, a legend of the English game, the brash and eccentric John ‘Budgie’ Burridge. Cut from the cloth of goalkeeper-turned-showman, more Rene Higuita or Mark Bosnich than Nigel Martyn, ‘Budgie’ saw enough in the Omani youth that his name was touted around England. And yet while it is the brilliance of the game’s great showmen that endears them to their adoring fans, the qualities that defined Burridge’s most unlikely protege were well-hidden for many years. It takes self-belief to go from a trial at Bolton Wanderers to a first professional contract four years later. It takes determination to uproot from family and friends on the Arabian Peninsula to fashion an unlikely livelihood amid the fjords of Norway. And it takes patience — hundreds of games spent watching from the sidelines across five seasons — for the handful of appearances that finally cement a career. Keeping this wiry 1.96 meter frame firmly fixed on solid foundations is a strong faith in Allah, and in himself, but also a tremendous sense of gratitude. Imagine the surprise then for the childhood fan of the German national side and Bayern Munich, when one chilly night in Bavaria in 2007, he would stand between the sticks opposite Oliver Kahn and produce a string of sublime saves to hand his side Bolton a shock 2-2 draw. It is performances like these that inspire not just the Omani fans, but also his national team. In 2009 at the Gulf Cup of Nations, Al-Habsi led Oman to its greatest-ever footballing silverware. Champions for the first time, Oman’s custodian won his fourth consecutive gong as the tournament’s best goalkeeper — and more remarkably, kept a clean sheet across the entire competition. For 480 minutes no side could beat the Omani captain, and when the final between Oman and Saudi Arabia went to a penalty shoot-out, there was only ever going to be one goalkeeper who would emerge victorious. It is this kind of big-match experience that makes Al-Habsi so crucial to the hopes of the tiny Gulf Sultanate. In Oman’s first two group-stage matches at the Asian Cup, Al-Habsi allowed five goals in losses to South Korea (1-0) and Australia (4-0). While the team has one more match on Jan. 17 against Kuwait, they won’t be able to advance to the knockout round. Even if Al-Habsi had been at the top of his game, Oman’s inability to put the ball in the net on offense put a burden on him that would be tough for even’s the world’s best goalkeepers to carry. 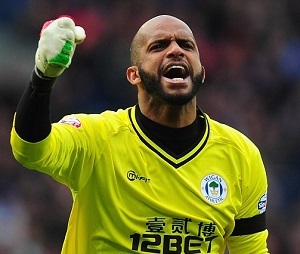 At his age, Al-Habsi’s window for playing at the game’s top level may be closing soon. But the face of soccer in Oman still has some time to be on the pitch when his country becomes a globally-relevant soccer entity.